Castaway to an Island of crystal clear water and golden sands, wild cliff paths and tendered gardens, cosy Inns and fine dining, pretty cottages and country style luxury hotel. Discover the jewel in the Channel Islands crown, without doubt the most enchanting of the islands, paradise can be found just 20 minutes from St Peter Port in Guernsey. Herm is an island of great natural beauty and tranquillity, which offers a retreat from the modern world and a return to life's purest pleasures. Herm where arguably time has stood still offers you picturesque walking, swimming in crystal clear waters, observing wildlife, eating and sharing happy times with friends and family. People come from near and far to let the stresses and strains of life melt away. Despite its popularity there is an absence of crowds even during the high season. Without traffic and no pressure to do anything this is the place of childhood memories: clean, safe and a source of endless adventure. Heading East, twenty minutes after leaving St Peter Port Harbour in Guernsey aboard "Travel Trident" ferry you will arrive at either Herm harbour on a high tide or disembark at the whitewashed Rosaire steps when the tide is low, from there you will make your way towards the main harbour which is about 8 minutes away, there you will discover the hub of the Island community, gift shops, taverns as well as the stunning White House Hotel with it's award winning gardens. From this point by following the path in a northerly direction you will arrive at the common and then onwards to the splendour of Shell Beach with its white sands stretching as far as the eye can see, strewn with the millions of shells that gives it it's name. Continuing on from here following the winding pathways you'll eventually come across the heavenly Belvoir Bay, the perfect spot to while away a few hours and bathe in the crystal clear waters. Both Shell Beach and Belvoir Bay are home to cafe's serving hot drinks and sandwiches not forgetting the all important ice creams. Through the centre of the island runs the tranquil Spine Lane, which stretches from the sand dunes in the north to the cliff tops in the south. At sundown swallows sweep up and down this lane and with the stunning variety of butterflies that adorn the hedgerows which is testament to the environmentally friendly way in which the island is managed. 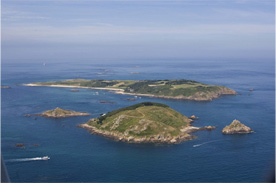 By the time you reach the picturesque campsite, you will start to feel as if Herm has been lifted straight from the pages of a 1950s children's adventure book. 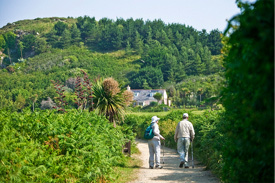 In the heart of the island are the granite holiday cottages with gardens full of tropical plants where visitors can live the "Herm life" for a while. The tiny 11th century chapel sits close by. Herm is as perfect for parents who want carefree fun for the family as it is for those adults seeking solitude and relaxation. If you are the former you will watch your children blossom in the freedom that the island offers and if you are the latter, you will find many a spot to take a breath and enjoy being away from it all. Whatever the season, one of Herm's biggest attractions is the way it draws you in to the great outdoors to make the most of its natural splendour. 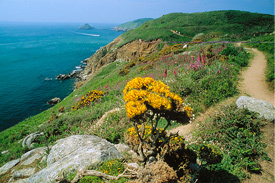 As well as the glorious beaches, the island also boasts fabulous cliff walks taking in views of all the Channel Islands and being able to view France on a clear day. Flowers are in abundance and sea birds including puffins and turnstones and many in between are on show. There is a sizable colony of Atlantic seals that have made their home in the northern rocky outcrop of The Humps. Recordings of minke whales, harbour porpoises and risso dolphins are frequent and both bottlenose and common dolphins are regularly observed. The temperate climate allows for an exotic and broad array of flora from pink fuchsia-pink foxgloves to succulents not generally seen in the northern hemisphere. The common alone boasts more than five hundred species of wild flower and tenants from the late 18th century have left their mark on the landscape with the introduction of new species such as Monterey pines and New Zealand flax and if you look up as you explore you will be amazed by the diversity of the canopy. 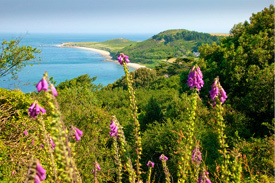 There is always something new to discover on Herm. Although you can walk around the island in a couple of hours, the changing tides, light and seasons create variations in views, with colours and moods to last a lifetime. The fact that the island measures just one and a half miles in length makes its diversity all the more remarkable and all the more accessible. Perhaps that is why so many visitors return year after year to discover it all over again.